I’m always fascinated with historical photographs. I used to archive and preserve historical photographs for a living earlier in my life, so I have a great respect and affection for them. 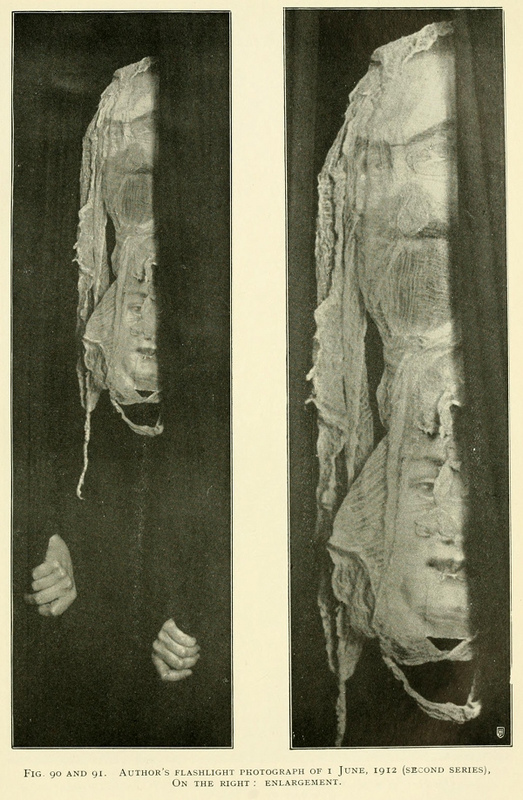 These photos are from a collection and are supposedly of spirits and ectoplasm from seances. I have to admit, I have never seen ectoplasm like this (it does resemble cheesecloth in the photos) and the spirits seem 2 dimensional. Spirits don’t appear like this. They might be solid or they might be transparent. But there is always something off and out of proportion with them. They aren’t coming out of cheesecloth or stuck onto someone (the faces were in fact made out of magazine pictures and paper). The great thing about the photos is how it lets us look into the “creativity” of the seance medium and a glance back to history. Even if it was to purposely misguide people or to give them comfort that their deceased loved ones were around them. I am not judging, just enjoying.